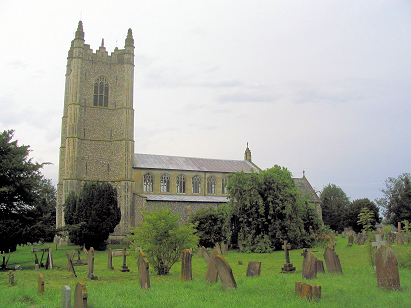 The parish of Redenhall lies in southern Norfolk and forms a substantial portion of the boundary with neighbouring Suffolk. Redenhall lies roughly midway between the Norfolk market town of Diss and the Suffolk one of Bungay, just north of the River Waveney, that forms the border, and crossed by the A143 road which heads eastwards along the border of the two counties. 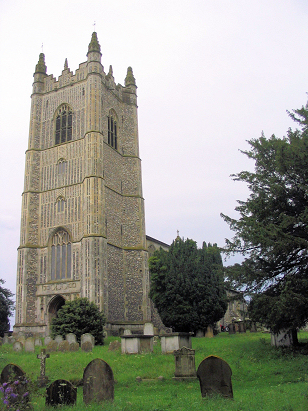 Redenhall, itself, is rather small but as the parish also includes the village of Wortwell and the substantially larger one of Harleston (before it obtained its own church) the parish held a substantial population. The parish was previously plagued by the traffic along the A143 but a new road which bypasses the main settlements has left the three villages peaceful and prosperous. Harleston, itself, is the major settlement and its centre rivals the larger towns for its shops, pubs and other businesses. Altogether Redenhall parish holds a thriving community. St Mary's church is located in the small village of Redenhall it stands to the south of what was once the main road and is now a quiet lane and the church is all the better for it. Standing on an elevated site the building dominates for miles around. The church is a triumph of the Perpendicular period, its imposing western tower rightly a land mark of the area. Only the southern doorway and arcades (both in Decorated style) differ from the Perpendicular styling and they do not look out of place. Pevsner waxes lyrical about the building describing is as "imposing" and "beautiful" a fitting tribute for a fine building. The dating has been put to the late 15th century but the Decorated pieces probably indicate a former building or a more prolonged building period. Three registers cover the period of the transcript, the first (a 1600-entry book) covers 1813 to 1841 and is filmed on Microfilm MFRO522, the second (an 800-entry book) covers 1841 to 1863 this is covered by Microfilms MFRO522 and finished on MFRO523 and the third (also 800-entry) covers from 1863 to beyond the end of the project period and is also on Microfilm MFRO523. These two films, in the collection of the Norfolk Record Office, are both relatively recent filmings and benefit from the good quality images attainable today. This is somewhat necessary as the standard of cleric is highly variable. Whilst the first book is extremely good that of the later entries (roughly corresponding to the period when birth dates are not given) is rather poor being scruffy and difficult to read at times. Whilst every effort has been made to minimise error they cannot be totally ruled out during this poor clerical period.